Stephen Coffey was once a college player himself, setting team records with the UMass-Boston from 1988 to 1990, including a 34-game hitting streak from 1988 to 1989. Twenty years later, it was Coffey working with college players, serving as coach for the summer collegiate league North Shore Navigators, according to The Winthrop Transcript. "It's been fun and rewarding to work with the college players and to be able to impart some of the things to them that I've learned in my years in college and professional baseball," Coffey told The Transcript in June 2010. "It's also great to have my brother helping the team out in the front office." From those beginnings at UMass-Boston, Coffey went on to a professional career, but not a long one. Coffey ended up playing just two seasons, making it to single-A, but no higher. Coffey's professional career began in 1990, taken by the Cubs in the 20th round of the draft out of UMass. He went there from Winthrop High in Winthrop, Mass. At UMass-Boston in 1988, Coffey hit .402. In 1989, he hit .412, the seventh and ninth best averages in school history. It was also over those two seasons that he picked up that 34-game hitting streak. His career batting average of .379 is still second best at the school. 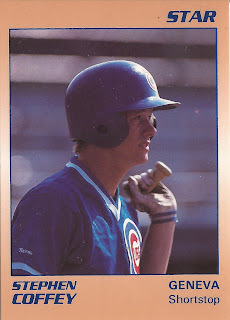 With the Cubs, though, Coffey couldn't replicate his college hitting success. Sent to short-season Geneva that first year, Coffey hit just .191 over 67 games. He knocked in 21 and stole eight bases. For 1991, Coffey saw 11 games up at single-A Peoria and 14 more back at Geneva. Between the two, he hit just .167, those 25 games his final games as a pro.